FIDEDidn’t I just crush this guy? In Game 3 of the World Chess Championship in Sochi, Russia, challenger Viswanathan of India stormed back into the match with a decisive, crushing win over titleholder Magnus Carlsen — just two days after Carlsen crushed Anand in Game 2. The match is now tied. Each player has a point and a half, with 9 games left to go. It was a must-win situation for Anand, playing white. It was also his first victory over Carlsen in some time. And it completely changes the vibe at the WCC. Both players have now landed heavy blows and done so with powerful, exciting chess. In my recaps of Game 1 and Game 2, I covered some of the basics of what in chess are called “openings” — the crucial first 10-15 moves of each game, moves that set the stage for what will follow. If you want to review, have a look at those posts. In Game 3, the 44-year-old Anand decided to get aggressive and fall back on what Grandmaster Peter Svidler, commenting for the official broadcast, suggested was his biggest advantage: a deep understanding of chess theory. It was a brilliant decision. At 23, Carlsen is strongest player by rating (2863) that we’ve ever seen. He’s set the chess world on fire and took the title of World Champion for Anand last year in emphatic fashion. But if he has a weakness, it’s that he hasn’t studied openings as deeply as Anand, who is from a generation of elite players for whom opening study was critical. Carlsen just wants to get a relatively balanced position after the first 15 moves and then “play chess.” And play and play and play. And play. And play. And play some more. He’s now legendary for grinding opponents down in gruelling endgames. It’s his torture chamber. With Game 3, Anand chose to plunge Carlsen into his own version of a torture chamber — an almost bottomless pool of theory. It’s not that easy for me to explain what Anand did. After all, it started simply: he moved the pawn in front of his queen forward two squares: 1. d4. Chess.comAnand’s first move: 1. d4. Carlsen replied by playing his Knight to f6. Chess.comNot attacking the white pawn. Anand played his pawn to c4. Chess.comAnother pawn to the center. 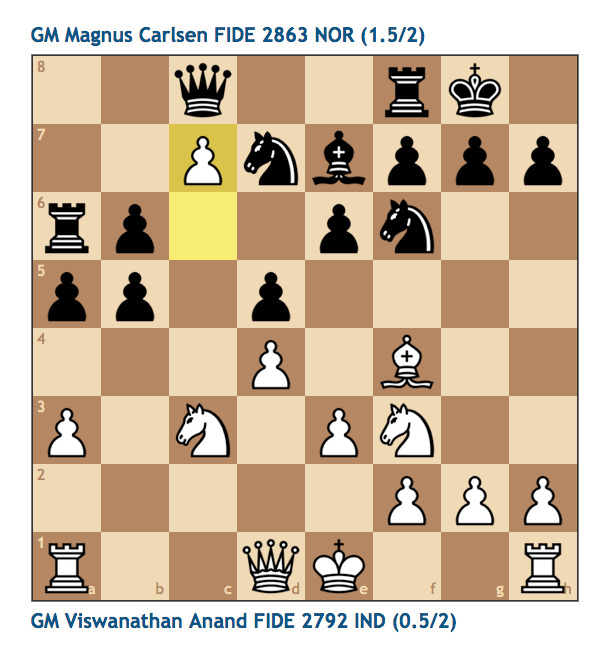 And Carlsen pushed his pawn to d5. Chess.comBlack pushes forward. Will he take the c-pawn, accepting the gambit? What followed was — eventually — an opening that’s called the “Queen’s Gambit.” The issue for black is white’s pawn on c4. Take or don’t take? The move order 1. d4 d5 2. c4… puts the question directly to black: Capture the c-pawn…or don’t? Answer “yes” and it’s the Queen’s Gambit Accepted. Answer “no” and it’s the Queen’s Gambit Declined. Chess.comWhen Anand moved the gambit c-pawn forward, the gambit was off. Gambits are old-school chess: the Queen’s Gambit has been around forever. In its most direct expression, white sacrifices a pawn to gain a lead in development. White has moved two pieces, while black has moved the same pawn twice. That might sound like nothing, but a being a single move behind in GM play can mean the difference between winning and losing. But the Queen’s Gambit has also been worked over and over by all the current top chess players in the world. 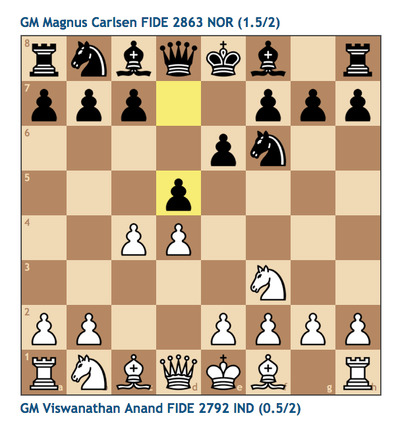 Just as in Games 1 and 2, Carlsen and Anand went with openings that are very much the ones that define elite encounters. 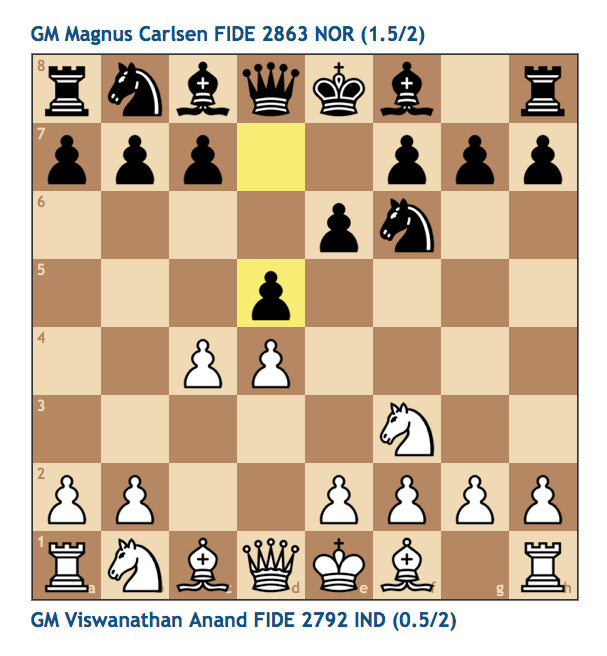 In Game 3, the gambit position emerged on the board, and Carlsen declined. What followed was chess of such withering sophistication and brain-crunching complexity that really only a player like Anand can keep up. Svidler admitted that he was out of his depth after move 10. 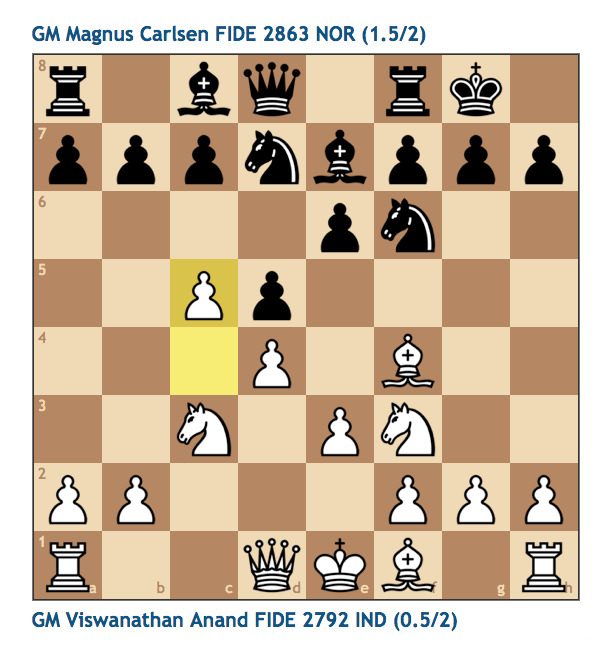 But Anand seemed to have the whole thing worked out to something like move 40. It was, to put it mildly, impressive. 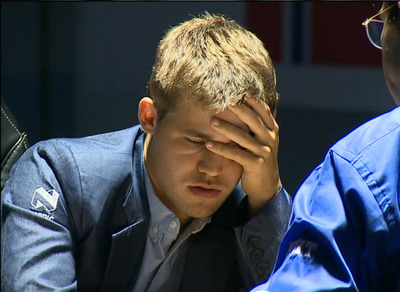 Carlsen looked almost completely bewildered half the time, his expressions over the board churning with anguish as he struggled to remember the many, many lines of play and positions that can emerge from Queen’s Gambit Games. 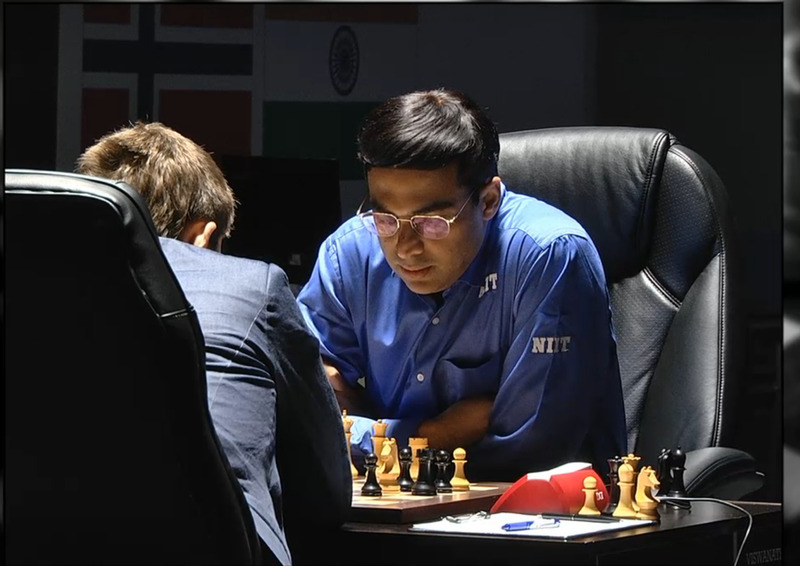 Anand looked serene, like a man meditating on a nice cup of tea. FIDEI feel much better today. Just another day at the office, playing the QGD. Except that this was the most important game of chess Vishy Anand has every played in his life. Just a quick personal note. I spent several months two years ago trying to get used to playing 1. d4 and then 2. c4. It drove me nuts. You can see why the setup appeals to GMs at the highest level, as opposed to favouring the so-called “King’s Pawn” games and the gambits that go along with the Queen’s Pawn games. As white, you sit there with this pitched battle happening on your queenside, one whole half of the board being blown to pieces, while typically your king and the black king observe the whole thing from a safe distance. Until it isn’t safe anymore. And this wild and magical thing can happen, like violent, seamless sorcery. In the hands of a Queen’s Gambit expert, everything you have left after the melee on the left side of the board has ended swings over to attack the typically castled black king. With withering swiftness, the by-then exhausted black player can suddenly find his king under assault. Beautiful, otherwordly checkmates can emerge. I just can’t handle it, as either black or white. You have to be much, much better at chess than I am to even get started with this stuff. If you think chess is a thinking person’s game — well, the Queen’s Gambit proves it is and then some. There were two key positions that emerged in the game. 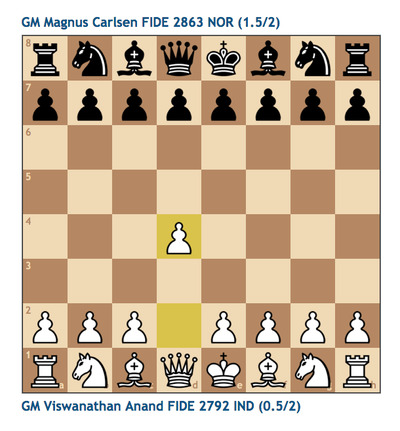 First, Anand got his c-pawn all the way to Carlsen’s seventh rank — one step from promoting to a queen (any pawn that makes it all the way to the other side of the board can be promoted to any piece of the player’s choosing). 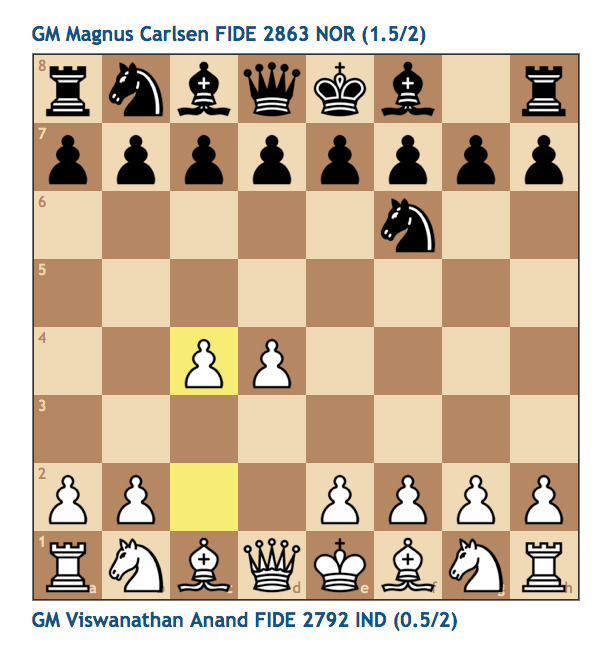 Anand defended this pawn in such a way that Carlsen’s queen was tied down for the entire game. It’s hard to win if you can’t move your queen. With this deadly outpost, Anand was able to control every subsequent position that developed. Early on, Magnus was stable, but then, on move 17, Anand put his knight on the g5 square. Carlsen then went into a very deep think and burned so much time in his clock that he never recovered. 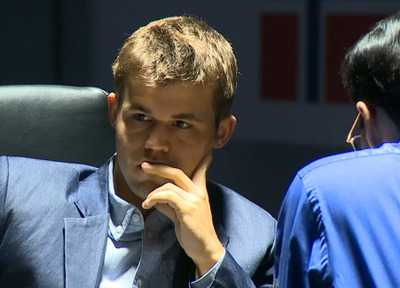 The game was far from from the first time control when Carlsen gave up, with less than a minute on his clock. Everything. 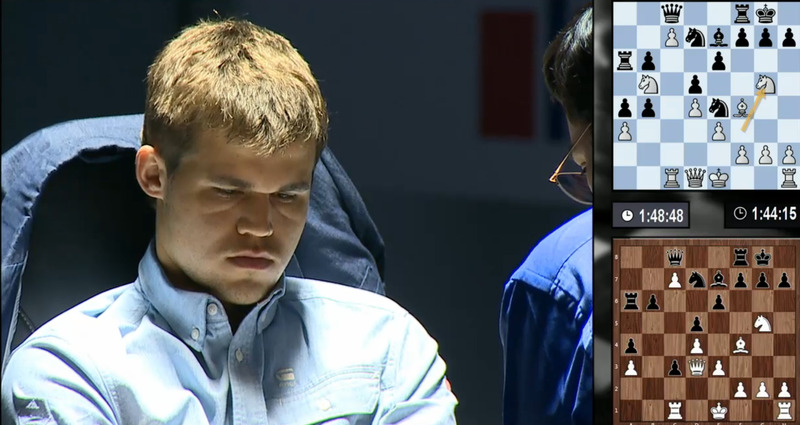 Carlsen memory is a weapon, widely admired. But it was clear that Anand had rolled out his nuclear counterattack: the deepest preparation he had available to him. Chess at the highest level is essentially a process of solving one complex problem after another. Carlsen’s prodigious mental database couldn’t see him through this one. It wasn’t Ng5 that flummoxed him. It was the lack of time to ponder all the variations in enough detail to draw the game. FIDEVishy has a plan. Note that at this point, the players were about equal in time on their clocks. So Carlsen did a very Carlsen thing: He got his a-pawn moving down the shattered queenside, in an effort to match that monster c-pawn of Anand. But it never turned into a problem for white. There was also a deeply planned pawn move by Anand that “started” an attack on the kingside, but it’s one of those plays that’s so hard to explain that you only need to know this: the game was 20 moves old at that point, Magnus was losing, and Anand seemed as if he had his lines worked out for another 20 moves. 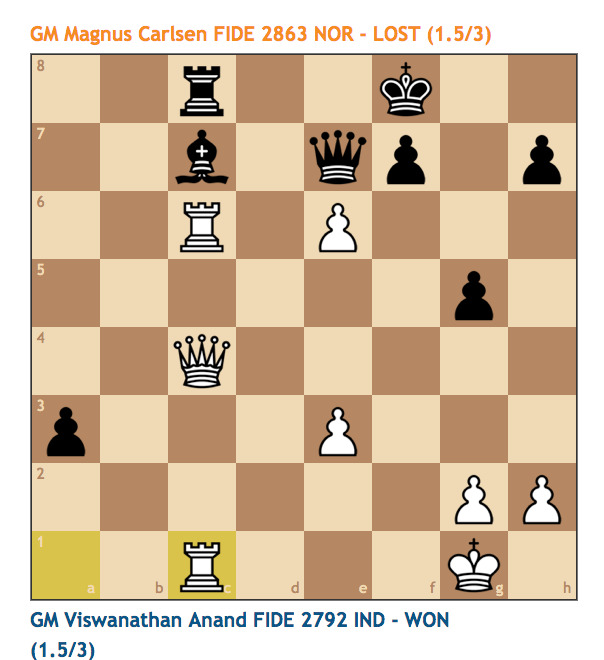 By move 34, Carlsen’s position was in ruins and he resigned just before running out of time on his clock. Chess.comThe final position in the game. I’ve been saying that in this match (rematch, actually), Anand must play aggressively, looking to win with white and black. Prior to the match, with each guy playing up to his level, everyone expected Carlsen to win. Anand had to unbalance that expectation. But after a draw and a loss, Anand was at real threat of losing his challenge by the third game. There was almost no way he could make up a deficit of two full points against Carlsen, even with nine games left. A draw was strategically tenable, but also kind of cowardly. One might have expected Anand to come out guns-ablazin’, trying to blow Carlsen off the board with tactics and dynamic chess. That would probably have failed. Instead, Anand found another reserve: his deep understanding of chess. He has 20 years on Magnus. In Game 3, he put every one of them to good use. 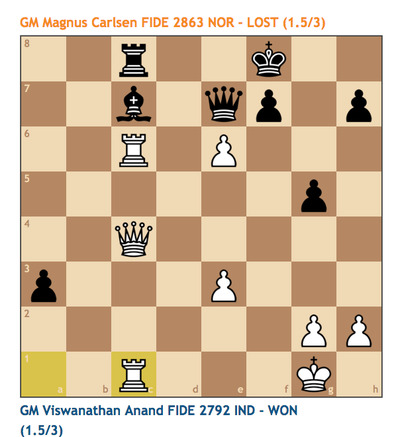 By this juncture of last year’s match between Carlsen and Anand, we were complaining about how boring it was: draw, draw, draw. What a difference a year makes. And for Anand, what a difference a day makes. You can watch the replay of the match here. And you can replay the game, again with great comments by GM Alejandro Ramirez, at ChessBase.